RIDE! ACCM célèbre 30 ans! To mark the 30th anniversary of ACCM, we are hosting an evening of unforgettable celebration! 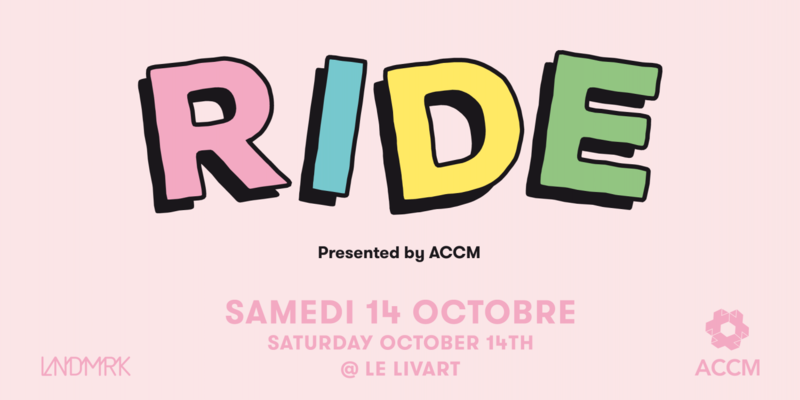 Ride, presented by ACCM, is tailored for an outer worldly experience intended only for fun in a light and vibrant environment that aims at sharing the success of ACCM, our dedicated supporters and members, and the strong relationships that cradle our community. The beginning of the evening will start with the private viewing of the exhibition Ride, by the artist Pony. In addition to numerous art installations, ACCM’s guests will be able to meet and greet with the artist and enjoy an open bar, hors d’oeuvres, and lively music. The second part of the evening will be a dance party that will take place downstairs: DJ set, open bar, and dance party. Purchase tickets through EventBee here.